With no unified slogan, office, or central organizing committee authority, the tea party seems to defy definition. But as tea partiers decide whom to support for the Republican nomination, the principles and goals of the movement will guide the future of the election. 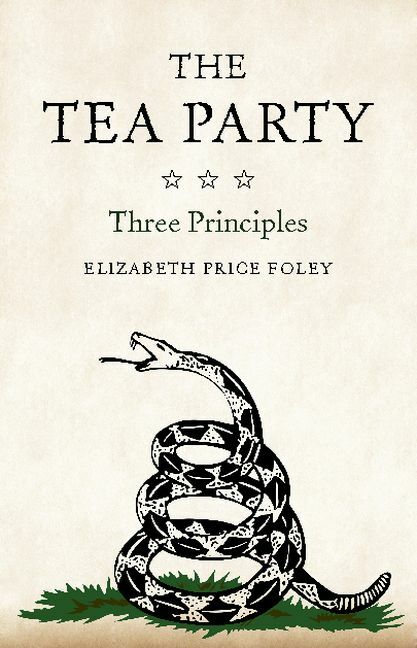 Elizabeth Price Foley, author of The Tea Party: Three Principles, goes beyond the rhetoric to help us understand the substance of the movement. We asked her more about her book, and the principles on which the Tea Party is founded. Get 30% off The Tea Party this month only, on The Cambridge Book Club! You call yourself a “recovering liberal.” How have your political views changed, and why? I was a liberal as a young adult. When I graduated from college at the end of Reagan’s second term, I went to the Hill and didn’t even think about applying for a job in Republican offices. I’d never really even had any meaningful exposure to conservative ideas. My high school, college professors, and law professors-even my constitutional law professors-were all liberal. It was my own curiosity and independent research about the Constitution during law school that caused my thinking to shift. I was particularly intrigued by original materials of the founding era-letters exchanged between the founders, their early lectures, the Federalist and Anti-Federalist papers, etc. All this research into original materials had a snowball effect on my understanding. And I can’t put the genie back in the bottle. I can’t blind myself to what the Constitution meant to the generation that wrote and ratified it, and how it’s been grotesquely distorted in the name of achieving ends desired by various groups. I think this is dangerous for the future of our country and our Constitution. If defending the value and stability of a written Constitution makes me “conservative” in the eyes of some, so be it. Why do you think there’s been such a desire of late to reconnect with the Constitution, especially among tea partiers? I think people have just had enough. The trillion dollar bailouts on top of the trillion dollar health care reform law were just the proverbial straws that broke the camel’s back. America had gotten off track. It’s off track because the federal government has swollen to become a Leviathan, spewing forth volumes and volumes of complex laws and regulations that don’t seem to make anyone’s life better. But even before these things, there was a growing realization that America had gotten off track. It’s off track because the federal government has swollen to become a Leviathan, spewing forth volumes and volumes of complex laws and regulations that don’t seem to make anyone’s life better. And all of this bloated government comes at an incredibly high cost, both now and for future generations-not merely in terms of dollars, but in a precipitous decline in both state power and individual liberty. The delicate constitutional architecture of federalism has been eroded. People wonder, “What happened to America?” This isn’t some sub rosa code for returning to the days when women were barefoot and pregnant, or blacks were sitting in the back of the bus. It’s a deep-seated anxiety about the Constitution being subverted in the name of expediency and political ends. Despite the fact that most schools don’t teach much in the way of civics anymore, ordinary Americans know enough about the structure of their government to know that this country is teetering on a dangerous precipice. The tea partiers’ desire to reconnect with the Constitution-many of them carry around dog-eared pocket Constitutions-is a reflection of this deep anxiety. You say in the book that the Tea Party is more about principles than about politics. How can candidates of both major parties harness those principles in their campaigning? If candidates want to harness the principles of importance to tea partiers, they need to know what those principles are, why they are important, and pledge to honor those principles if and when elected. It’s really that simple. There have been a few books about the tea party, including Jill Lepore’s The Whites of Their Eyes and Kate Zernike’s Boiling Mad. How is this book different? In a nutshell, I’d say my book is about substance. I don’t focus on individual tea party members or their feelings, per se. My book examines the substance that animates them-that common thread that weaves through a seemingly disparate group of individuals. With all the effort made to paint the tea partiers as white, racist, angry zealots, surprisingly no one has focused on what they’re really angry about – and it turns out that they’re angry about 3 very distinct, fundamental constitutional principles. And these 3 principles turn out to be critically important to all Americans, regardless of race, gender, or socio-economic status. How do you find the media’s representation of the tea party differs from the tea party you’ve experienced? The mainstream media’s characterization of the tea party is just a caricature-and an inaccurate one at that. When I’ve given talks about the tea party, I am inevitably confronted before or afterwards by someone who self-identifies him/herself as a tea partier, and who almost always holds a dog-eared, underlined, or highlighted pocket Constitution in their hands. They strike me as earnest and hungry to learn more about the founding philosophy and the Constitution. And as a constitutional law professor, I can’t see how this could be viewed as a negative. To have ordinary Americans hungering to learn more about their Constitution can only be good for the country. Having taught law students now for over 15 years-by definition college graduates who are the best and the brightest our educational system offers-I can say that such hunger for knowledge about the Constitution is desperately needed. We just don’t teach much about the Constitution anymore. And when we do teach it-in law school, for example-it’s often just summarizing or reading Supreme Court decisions. Indeed, most law students never even read the text of the Constitution itself! It is usually printed in the front of the casebook that law students read, but law professors rarely require students to read it or even refer to it when discussing Supreme Court case law. My point is simply that the Constitution has been somehow lost in the shuffle, and even our most educated Americans (including lawyers) have never read it, much less read any materials from the founding era. That’s tragic and dangerous for the future of our constitutional republic. So tea partiers’ interest and reverence for all things constitutional is both refreshing and desperately needed. For more on The Tea Party: Three Principles head over to the Cambridge Book Club.